Basic soap bases primarily contain all natural soap and a small amount of foam boosting additives, which produce a big bubble, creamy lather that customers love and expect with cleansing. The ten-pound block makes (40) 4 oz. bars of soap and measures 12" x 11" x 2.25". This soap is clear with a big bubble lather. Package: 10 lb Block Melt Point: 120-125º F.
Sorbitol, Propylene Glycol, Sodium Laureth Sulfate, Sodium Stearate, Sodium Laurate, Glycerin, Water. Sorbitol, Propylene Glycol, Sodium Laureth Sulfate, Stearic Acid, Lauric Acid, Water, Sodium Hydroxide, Glycerin. 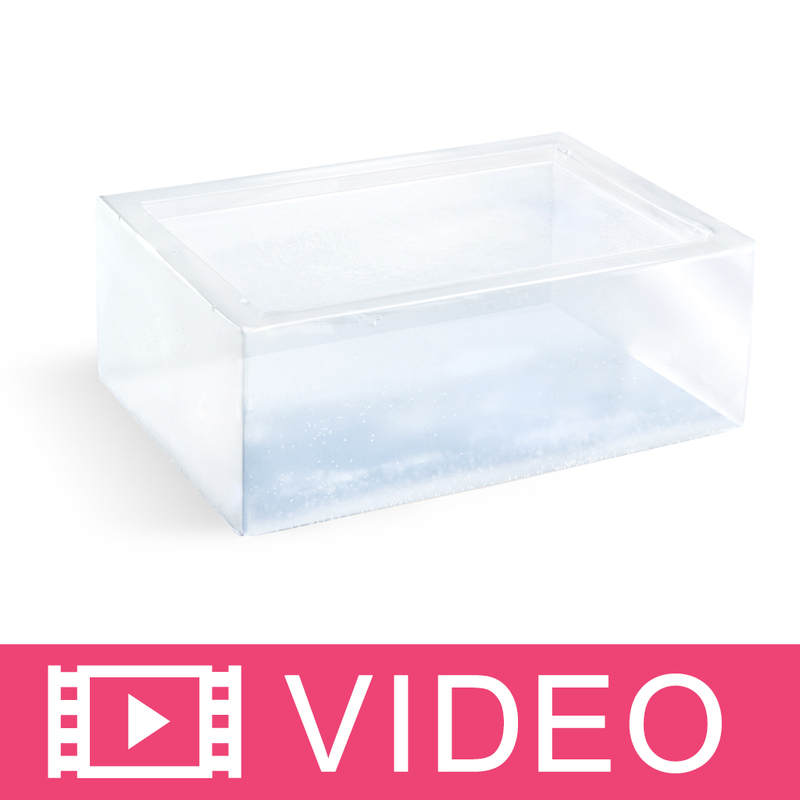 MELT: Determine amount of melt and pour soap base needed for your project. Carefully slice soap base into small pieces and place in microwave safe container - the packaging for this product is microwave safe. Heat on low at 30 second intervals. Stir between intervals until liquid. Handle hot soap carefully as it may burn the skin. Soap can also be melted in a double boiler. COMMENTS: One of my favorites! 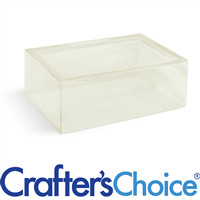 "Great soap base, LOVE IT"
COMMENTS: Great soap base, lots of lather, very clear and easy to work with! COMMENTS: Very good for the price!!! I am new to soap making and this soap was easy to use color add fragrance to, its wonderful I will buy again. "My favorite basic clear MP base." COMMENTS: This soap base never disappoints. It's easy to work with and takes colour and fragrance well. I usually must use detergent-free base because I work in a lot of humidity. COMMENTS: This base was so easy to work with and I’m in love with the price. Only my second use and was able to make beautiful bars that held color and scent very well. I have recommended WSP to my friends so they can enjoy this site as much as I have. "No complaints. Melts easy. " COMMENTS: No complaints with the product. I wish it shipped easier than the large block. COMMENTS: used all 10pounds in 2 weeks! COMMENTS: I love the crystal clear Clarity of this soap I have had so many friends and family compliment me on how clear it is and how much bubbles it produces and how it doesn't leave their skin irritated or dry and my customers are absolutely in love with the end results especially when I mimic water. Love this product so much I often reorder because I go through it so quickly I highly recommend this product to everyone for its great clarity it's high quality and the ease of use this is exceptionally one of the best soap sold here as for melt and pour goes. "Basic clear melt and pour soap base"
COMMENTS: This worked perfect for the project I needed it for and what a great deal! It took mica colors wonderfully and set up amazing. COMMENTS: Wonderful lather, and super ease of use! I love this base, and continue to purchase it again and again! Always packaged with care, I receive my base in great condition! "Clear Melt and pour soap"
COMMENTS: I love this soap. It bubbles well and is easy to work with. I use it in all of my soap making. It holds color well. It cuts nicely. Since I have started using this soap my overall soap sales have increased. I love how it makes my skin feel and I share that love with my clients. "great value for an excellent product"
COMMENTS: this is a LOT of soap! i didn't realize how much soap would be in this box but it's a great value and I do a lot of products with melt and pour. The soap is great quality and it feels great on the skin. when I finish this huge 10lb box I will definitely be buying more! COMMENTS: Great value. Large block of soap is a little awkward to work with. Quality of the soap is very good. COMMENTS: I love this base. I used it in place of the detergent free and am happy with the results. It has nice bubbles, wonderful at accepting color and melted nicely. So satisfied. COMMENTS: This base is great for most any "clear" project. Accepts stained glass liquid colors well. Am pleased with this base and will be buying more. COMMENTS: Really versatile base. Holds oils, embeds, colorants, scents very well. "Easy to work with. " COMMENTS: This is a nice base, it's pretty clear. I've used embeds with it and my soaps have turned out nice. Lathers well. COMMENTS: Great clear melt & pour. Just ran out of my last 10 lbs. & need more! I use it for embeds & some clear bars with goats milk. As another reviewer stated about the blue plastic getting caught in the soap, I too had the same issue with it. Just a little harder to cut it out, but no big deal. Will be ordering again. COMMENTS: Perfect pricing for a 10lb block of m&p! Works wonderfully and is always clear and stays clear after melting. COMMENTS: Love this soap! Super rich and smooth and leaves the skin feeling great! Easy to chop up as needed. COMMENTS: Great product, easy to melt, does the job but sweats easily. "My first melt and pour experience (clear)"
COMMENTS: My order was delivered within a very quick period. The soap came nicely packed in a crafters choice box and bagged in a blue bag inside. The soap was of course very sticky to touch but, that may be because, I had it shipped to the Bahamas. It melted very well in the microwave and the sent throw was great. I do not think that it required the full percentage of the fragrance that I placed in it. The lather is great. COMMENTS: I bought this base, mainly to do embeds and colored swirls in my loafs (M&P). This base is amazing! It colors well, I made a few bars with it and tested it. It lathers well, feels good on the skin. Since I use M&P for everything, I tried making embeds, loafs, single bars and they all turned out fantastic. The only thing I didn't like was, that the blue plastic wrap it comes in was (in some parts) embedded in the soap itself. Kinda made it hard to cut out what I needed, but honestly I can deal with it. The price and quality are totally worth it! COMMENTS: Good soap base, i use this to make fun soaps, sugar body scrub cubes, & ice cream sundae body scrub treats! COMMENTS: Came very quickly in the mail and is very easy to work with! I'm just starting to make soaps and melt and pour has been a great intro so far. This soap is also non drying, which is super important in my household! COMMENTS: This is a winner! It does not sweat and works amazing! COMMENTS: I use clear M&P soap base constantlyyyyyyy for making kids' toy soaps in particular. This base takes micas & liquid colorants nicely, keeps its color well, & has great clarity if you choose to keep it clear. Melts very quickly & sets within half an hour for my large bars. I have customers tell me all the time that it's nice & gentle on their sensitive skin. COMMENTS: I was practically killing myself trying to lift/cut up the larger blocks - these 10lb blocks are perfect! "Love this item. Will buy again. Melts great"
COMMENTS: I love this item. Will buy again. Melts great, holds frag and color wonderfully. COMMENTS: Not bad at all, just did Not lather as much as I expected. "What oils can be added to clear melt and pour that will not change or cloud the clear color/feature of this soap." Staff Answer We do not recommend adding oils to MP soap because it will cut down on the lather. If you do want to add an oil, we would recommend staying with clear oils such as jojoba or MCT.